A friend used to work for Social Services hoping to help unfortunate folks. Sadly, after a few years at it and pretty much disappointed about the system she came to the conclusion that ‘We’re paying people no to break into our homes and rob us’ …. wow, eh? I’m very interested in talking to you about this research you posted, here. Can you contact me via email? It’s jthompson7265@gmail.com . Thanks. Can you please demonstrate how you devised a $15,000 childcare benefit? 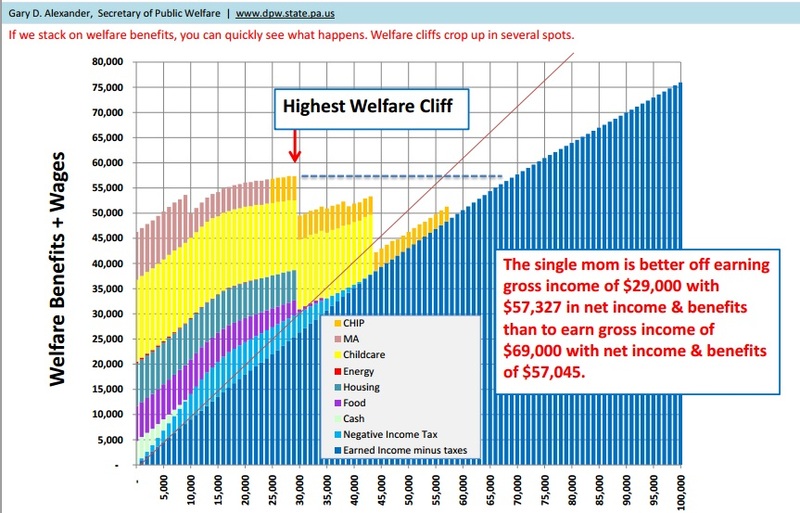 If benefits were gradually eliminated it would eliminate the cliff. For example, cut benefits 60 cents for every dollar a beneficiary earns above $20 per week. This plan already exists in the Unemployment system. I’ll experience this soon. My fiance is getting supplementary income and health card because of her serious health problems. That goes away when we get married because my income is 70 cents an hour too high. So I get a $1000 hit/month for insurance and the income she loses. Tempting to tell the employer to give me 2 weeks leave up absence a year but we will just deal and do what we need to do. This wouldnt have been an issue 3 years ago but I took a 24% cut in pay when I get layed off. We’re hoping the medical care she is currently getting enables her to get out of this health problem so she can work and I can find a better job than the current asshats I work for. She was told by a social worker that because she was responsible and didnt pop kids out that she couldnt get as much aid. This was exactly my experience as I transitioned from public assistance to self-sufficiency – a decade of decent raises with no improvement in my net income or standard of living. There were many days I wondered if it was worth it . . . it’s a real, substantial issue that won’t be solved by people sniffing about freeloaders. We need to figure out a way to incentivize people to get past the hurdles, perhaps by making the assistance benefits less attractive or the reductions in assistance less draconian. Encourage people to get out of that valley, don’t sneer at them for finding the climb difficult. Your term “less fortunate” is misleading. More accurate to describe as “non achievers”. Years ago, when I was in fast-food management, I remember one of my employees (a single mom living in subsidized housing, etc.) telling me not to give her more than a certain number of hours, because if she made over $X/wk she’d go into a different bracket for calculating her rent, etc., and it would actually cost her money. At that time, I realized that our so-called “progressive” tax system, once one considers a loss of benefits as equivalent to a tax, is in fact very regressive, with the effective marginal tax rate for low-income people at or in some cases above 100%. By that I mean that there these “cliffs” at which earning $100 more not only fails to put ANY of that $100 into the worker’s pocket, it actually removes far more than that. I think you meant “goof off”. Great article. And to think that the graph does not even seem to include Obamacare, a program that will radically change the graph, for the worse. None of the other two major welfare entitlement programs (Medicare and Social Security) are as redistributive – and thus as long term destructive – as Obamacare. The pace of American decline will greatly accelerate once Obamacare irreversibly flattens the effort-reward curve come 2014. American voter lemmings are walking towards the Europeanization of HopNChange – Decline by design, decline by the irresistible short term benefits of redistribution. The skeletons of many one cultures who listened to those sirens lie on the rocks of HopNChange. American voter lemmings will get what they want – in the short term – and what they ultimately deserve in the longer term: loss of exceptionalism and decline. And that is exactly why people in the UK on benefits, choose to remain on benefits, both in terms of not wishing to work at all, or to try and earn more, but loose benefits in doing so.